Although Alarnath is a little known holy place, I had always been fascinated with the idea of going there. 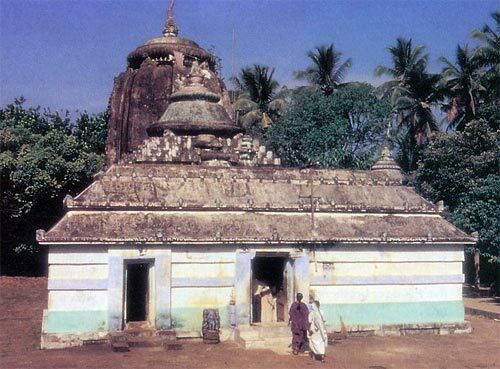 Sri Chaitanya Mahaprabhu would stay at Alarnath during anavasara, the two-week period when Lord Jagannatha rests in seclusion before the annual Rathayatra (chariot festival) in Jagannatha Puri. Lord Chaitanya couldn't bear staying in Puri without seeing His beloved Lord, and at Alarnath He would reveal the highest spiritual emotions, pining in ecstatic separation. I'm traveling with a group of five others to Bentpur, the village near the Alarnath temple, seventeen kilometers west of Puri and about five kilometers inland. To reach Alarnath, Lord Chaitanya would walk along the beach, but today most pilgrims take a bus. We're traveling by jeep, and the ride along the flat, winding road gives us beautiful views of agricultural fields and large coconut-palm forests. The rich land of the coastal plain supports many people, and we pass quite a few villages during the one-hour ride. It's seven in the morning, and people are rising to bathe in ponds and rivers, as they have for thousands of years. Along the way we see many palanquins that house deities from area villages. The deities are on their way to Bentpur for an annual festival that brings together deities of each of the five Pandava brothers, the pure devotees of Lord Krishna whose lives are central to the epic Mahabharata. According to local tradition, anyone who sees all five deities in one day attains liberation. Because the deities' temples sit some distance from one another, visiting them all in one day is impossible. In former times a king once tried on horseback but failed. Now once a year the five deities gather at Bentpur and pilgrims come from all over the area with deities from their villages. More than a hundred deities—Radha-Krishna, Siva, other devas—will be arriving for this year's festival, to be held tomorrow. We arrive in Bentpur in a typical Indian bazaar with blaring cinema music. It’s a small village with a few hundred houses. Although it’s still early, merchants are opening their small shops and kiosks to sell their produce, grain, spices, cloth, hardware, stainless-steel pots and pans—just about anything you’d need. We walk a hundred yards or so to the Alarnath temple and find ourselves in a peaceful, serene setting amid palm trees moving gently in the breeze. We imagine what the place must have been like when Sri Chaitanya Mahaprabhu stayed here five hundred years ago (a blessed time without loud-speakers). As with the Jagannatha temple in Puri, Westerners are not allowed inside for an audience with Lord Alarnath. Because it’s a fairly small temple, we can see the deity from outside, al-though not clearly. Lord Alarnath is a four-armed Vishnu deity. At His feet kneels Garuda, His eagle-carrier, hands folded in prayer. The Lord’s consorts Sri and Bhu also accompany Him. The temple also contains small Deities of Lord Krishna’s queens Rukmini and Satyabhama. Bas reliefs of Lord Brahma and Lord Siva grace the ceiling of one of the halls leading up to the main chamber. 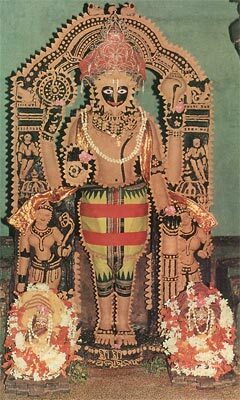 The temple also holds a deity of Lord Chaitanya known as Sad- bhuja, or ‘Six-armed,’ signifying Lord Chaitanya’s identity with both Lord Krishna and Lord Rama. A stone slab in front of the deity bears impressions from Lord Chaitanya’s body. When Lord Chaitanya first lay in full obeisance before Lord Alarnath, the stone beneath Lord Chaitanya melted from His ecstatic touch. 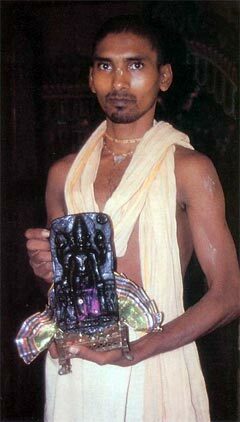 The government of Orissa manages the temple, and brahmanas from about fifty families take turns serving the deities. Each family specializes in one aspect of the deity service, the tradition passing from generation to generation. Some families cook for the deities, while others offer the deities their meals, worship them, decorate them, and so on. The temple owns about sixty acres of land, some used for the deities and some for their servants. Near the Alarnath temple is the Brahma Gaudiya Math, established by Srila Bhaktisiddhanta Sarasvati Thakura in 1926. The temple houses deities of Sri Chaitanya Mahaprabhu, Radha-Krishna (Gopi-Gopinatha), and a small Lord Alarnath. A priest of the Alarnath temple had found the small deity during excavation and had installed Him in the temple. One night the deity appeared to the head priest in a dream and told him that He wanted to be worshiped by Bhaktisiddhanta Sarasvati. The next day the priest presented the deity to Srila Bhaktisiddhanta, who happened to be staying at the Gaudiya Math temple. Srila Bhaktisiddhanta, who was born in Puri, loved Alarnath. He said that the place is the same as Vrindavana and that the small lake there—on whose banks Lord Chaitanya would rest—is the same as Radha-kunda, the most sacred of lakes. In 1929 Srila Bhaktisiddhanta arranged renovation of the Alarnath temple and construction of a boundary wall. It is said that he was so eager to see the work completed that he would roll cigarettes for the workers to keep them on the job. He also placed sculptures of Vamana, Nrisimha, and Varaha (three incarnations of Lord Krishna) in alcoves in the temple’s outer walls. After visiting the Alarnath temple and the Brahma Gaudiya Math, we go to the other end of Bentpur village to the birthplace of Ramananda Raya, one of Lord Chaitanya’s chief associates. We meet Mr. P. K. Pattnaik, a descendant of Gopinatha Pattnaik, a brother of Ramananda Raya. Mr. Pattnaik and his family show us a ceremonial sword that belonged to Ramananda (a governor) and old government documents written on palm leaves. Across a dirt path from the Pattnaik’s home is a temple of Ramananda Raya and Sri Chaitanya Mahaprabhu, depicting their meeting on the bank of the Godavari River. Alarnath is not a big or famous holy place and probably never will be. Yet Gaudiya Vaishnavas, the followers of Lord Chaitanya, revere it as an important site of Lord Chaitanya’s pastimes. The great Gaudiya Vaishnavas spiritual master Bhaktivinoda Thakura has sung, gaur amara, je saba sthane, karalo bhramana range, se-saba sthana heribo ami, pranayi-bhakata-sange: “I aspire to see, in the company of loving devotees, all the places visited by Lord Chaitanya.” And Srila Prabhupada writes, “A devotee should make a point of visiting all the places where Sri Chaitanya Mahaprabhu performed His pastimes. Indeed, pure devotees of Sri Chaitanya Mahaprabhu even want to see the places He simply visited for only hours or minutes.” How important, then, is a place where Lord Chaitanya stayed every year, exhibiting the most intense mood of separation from His beloved Krishna!